Saturday September 01st sees the 10th annual Crosshaven Triathlon take place and by all accounts this year is expected to be the biggest and best yet with a large number of entries received by the organisers. ‘There’s going to be a real carnival atmosphere in Crosshaven during the triathlon’, remarked event chairman Bernard Lynch. The event covers a 500 metre swim from Currabinny Pier to Hugh Coveney Pier in Crosshaven, a 10 kilometre cycle to Leary’s Cross and back and finally a 5 kilometre run around the centre of the village with the finish line situated at the Centra Supermarket along Strand Road. Teams of three – one for each discipline – along with over 80 individual competitors will take part this year in what has become the largest sporting event in Crosshaven in recent years. Hundreds of spectators are expected to line the route cheering on the swimmers, cyclists and runners as they take part in each event, with a huge number expected in the centre of Crosshaven and towards the finish line. Amongst those competing this year will be a number of Irish International swimmers, English Channel swimmers and local politicians with Minister Simon Coveney, a regular participant and supporter, scheduled to take part. Members of clubs, schools, groups and local organisations are also taking part, adding to the local aspect on the day – many hoping to improve on last years times and fulfilling a personal accomplishment in just taking part. Funds generated from the event will go towards the Crosshaven Tidy Towns Committee, Crosshaven Development Committee, Crosshaven St Vincent de Paul and the Crosshaven Camogie club. This will bring the amount raised since its inception to well over €120,000. Members of the Crosshaven Vintage Cycle and Classic Car Club will have a number of their vintage vehicles on show in the main car park in the centre of the village. The 10th annual Crosshaven triathlon commences at 5pm sharp on Saturday 1st September. Traffic restrictions apply for the event duration. 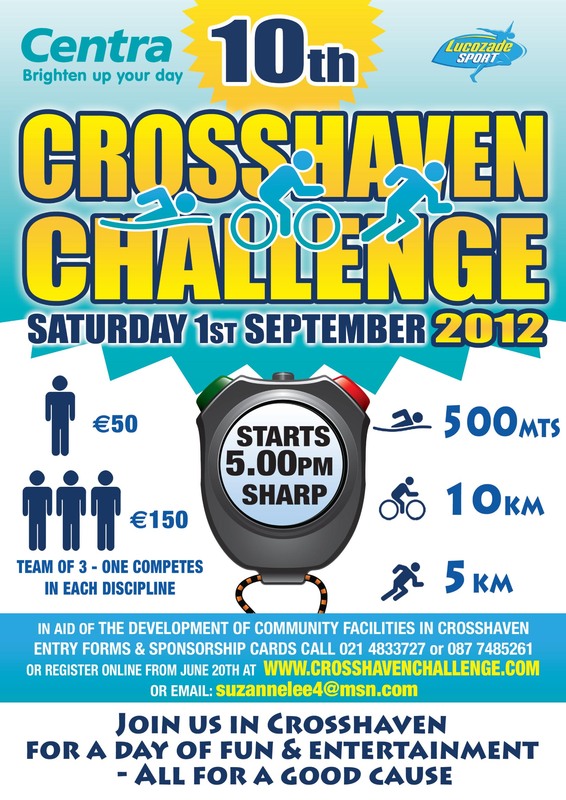 For further information contact and entry on www.crosshavenchallenge.com or Bernard Lynch – 0862257058.